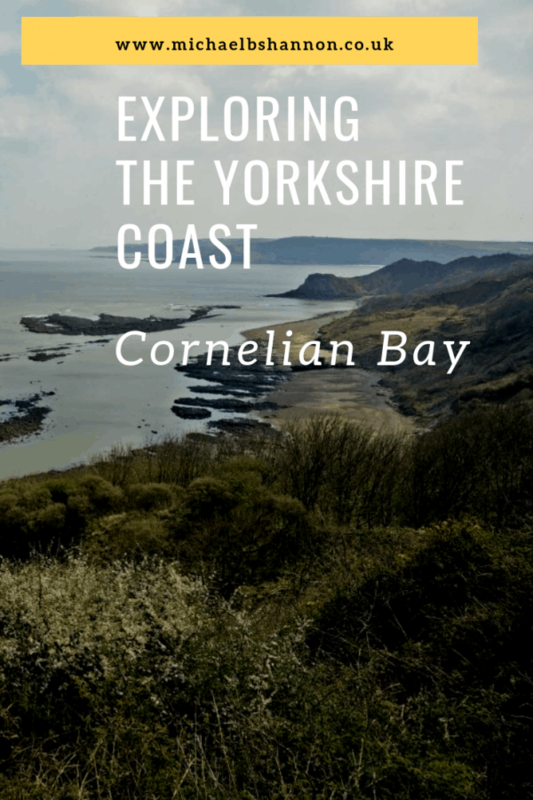 Cornelian Bay lies between the headland of White Nab, south of Scarborough’s South Bay and Knipe Point just north of Cayton Bay. The Cleveland Way footpath runs along the clifftop for the length of the bay. The relative inaccessibility of the bay, means that even on the busiest bank holiday, the number of people on the beach can be counted on one hand. Cornelian Bay is a fantastic place for a peaceful walk. The bay is not easy to get to, and a visit needs a good low tide. Search UK Tide Times for tide times. Access the starting point by heading out of Scarborough along the A165. At the South Cliff roundabout turn left along Filey Road and find Cornelian Drive on the left-hand side. Drive part way around Cornelian Drive and look for a lane off to the left. The lane runs along the edge of the golf course and leads to a small car park. If the car park is full there is ample space to park on Cornelian Drive itself. Once you have parked, bear left away from the pumping station, cross a small stream and look for a steep, wide gravel track heading downhill. There is not a real path near the bottom, so take care scrambling down the clay cliff, especially when it’s wet. Once at down at sea level, navigate across an area of uneven rocks to reach the main beach area. The name of the bay is taken from the dull red semi-precious stone carnelian, which occasionally gets washed up on the beach. The carnelian or cornelian stone is a type of chalcedony quartz similar to sard and sardonite. The name of this gemstone refers to its color which ranges from pale red and orange to dark red and brown. Head south along the beach towards Knipe Point, easily recognised by its hump backed shape. Halfway along the beach is an obvious Second World War lookout or pillbox. There is another one at the end of the beach at Knipe Point. Be careful if you’re tempted to wander out over the scar and rocks at low tide. You may become marooned on an island as the inner lake floods quickly when the tide comes in. Perilous Rocks are well named. At low tide it is possible to walk around Knipe point. If you are dog walking this is something I’d avoid. Climb the cliff to the right of the pillbox to enter Johnny Flinton’s Harbour in Cayton Bay. This is a fairly easy scramble when it’s dry. The walk then becomes extended along Cayton Bay. You could return along the Cleveland Way footpath at the top of the cliffs, which would take you back to your starting point. The cliff top views of Cornelian Bay from the clifftop are magnificent. This is a fairly short walk and it could be extended by starting at the Sea Cliff Road car park in Scarborough, which is also the starting point for the Scarborough South Bay walk. From the car park follow the Cleveland Way footpath to Cornelian Bay. Don’t forget the three-hour limit at the car park.